“Five stories with five critical messages on life… Five situations with the protagonist making a decision that changes his life... Five circumstances that show you that life is never fair and yet… one needs to make the critical decision. Amar, a promising stock analyst, gets the job of his dreams. However, circumstances lead to his failure. What does Amar do? Uma is looking for the purpose of his life. He wants to give up the luxuries of life to find the truth. Does he eventually succeed? Ravi loses his job one fine day and befriends those who tell him that the rich should sacrifice for the poor. He believes them. Does he benefit? Vikas is shocked and annoyed when his parents decide to take him to their native village instead of Switzerland. What does he learn? When I first heard about this title, I expected that this book will be packed with 5 stories told in an extra-ordinary way. The word ‘soul-searching’ in the title of the book is what got my attention. Now, Lets find out if the book live up to my expectations? 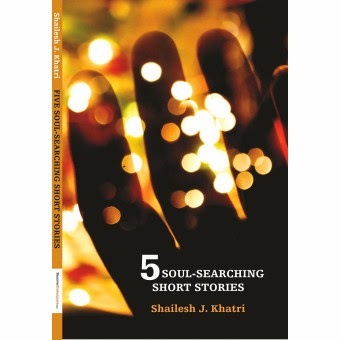 Consisting of a bare 115 pages, this book 5 Soul-Searching Short Stories by Shailesh Khatri falls in the type of book that you can finish reading in a short reading session. The plots of the story are such that you can relate to it – they are picked from the everyday happenings in an ordinary man’s life. However, the way the stories are written and narrated doesn’t make the desired impact. There is something lacking in the narration which makes the stories easily forgettable. All the stories start well and have the capacity to keep the reader’s engaged, but somewhere in between the narration falters. The plots are good, but depth in characterization is lacking. Another minus point was that the stories were quite predictable. So, the reader had nothing to look forward to at the end of a story. I understand the author has put in a lot of effort in his maiden book. I hope my review will help him in doing away with these drawbacks in his next work.